Wave motion and underwater currents can give rise to complex phenomena, difficult to study and analyze. 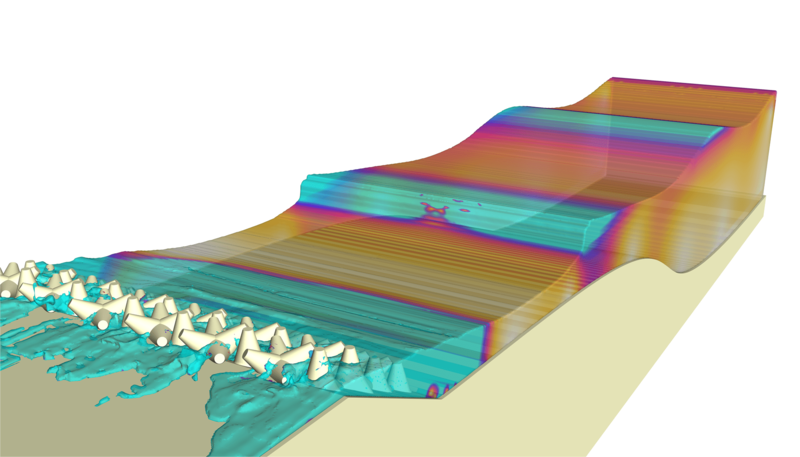 Over the last decades the developments in the field of numerical simulations have provided experts in this field with software more and more valid and accurate, allowing to solve difficult problems and create improved facilities. XC Engineering for more than ten years successfully work on different case studies, ranging from the wave impact on coastal structures to the study of the motion of offshore buildings subject to complex dynamics. For its studies, our company mainly relies on the fluid dynamic software FLOW-3D, with which it becomes easier to analyze all the performance of a structure, such as static and dynamic stability or the possibility of energy recovery. FLOW-3D, in fact, allows to study the coupling between the dynamics of the fluid and the response of adjacent structures: this, combined with the experience of the technicians and the use of advanced optimization algorithms, allows to maximize the efficiency of any system. Moreover, the company is the official dealer of the software that it uses and therefore can provide its customers with a wide range of possibilities, from simple advice to the sale of the product with a high level of technical support. A particular application is the study of the motion of boats, field in which XC Engineering has collected over the years extensive experience and official awards.